Parliament passed the Contraception, Sterilisation and Abortion Act 1977 as a result of an inquiry by a Royal Commission. In the 1970s there was heated debate around women’s access to contraceptives and abortion services, and the level of control a woman was entitled to over her own body. 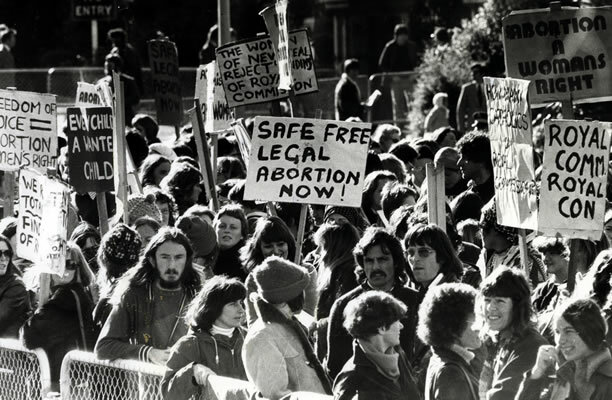 As these issues aroused impassioned views, in 1975 the government set up a Royal Commission on Contraception, Sterilisation and Abortion to conduct an inquiry. Their recommendations led to enactment of new legislation. The Act was established to specify the circumstances in which contraceptives could be supplied to young persons; sterilisations could be undertaken; and abortions could be authorised. The legislation decriminalised abortions for pregnancies of less than 20 weeks, on the proviso that certain conditions were met as set out in the Crimes Act 1961, and that the abortion was authorised by two certifying consultants – making it harder to get an abortion. The system did not work well, and hundreds, perhaps thousands, of women travelled to Australia for abortions because of difficulties in New Zealand. In 1978 Parliament amended the legislation. While abortion is legal in New Zealand, it is still considered a crime under the Crimes Act unless performed for approved reasons. Coming into office in 2017, Prime Minister Jacinda Ardern and the Labour Party indicated their intention to remove abortion from the Crimes Act and review abortion legislation. We have 14 biographies, 10 articles, related to Contraception, Sterilisation and Abortion Act 1977 passed.